Although video inspection microscopes play an essential role in high magnification process monitoring and machin e vision, they have invariably been equipped with objectives primarily designed for visual purposes. In video terms, such objectives have stated numerical aperture (N.A.) ratings that are more theoretical than practical. This is because "visually-dedicated" objectives "presume" that an end-user will constantly monitor each image to obtain a proper balance between contrast and resolution?through either an adjustment of condensing optics, a variation in aperture?or both. Unfortunately, it is impractical to monitor each image and adjust this balance on an individual basis in automated video applications or where many objects are being constantly examined. Moreover, the cross-over point between resolution and contrast occurs at less than full aperture (full N.A.). The Achrovid Series - which presently consists of six objectives ranging from 2x, 2.5x, 3.3x, 4x, 5x to l0x?were developed to overcome these limitations. To do so, the Achrovid objectives were designed upon criteria originally developed by E.M. Nelson. This assures the best possible maximization of contrast and resolution for video applications. As a result, Infinity-Photo-Optical Company has developed the first range of specifically "video-dedicated" microscope objectives. Even though their stated N.A. ratings are somewhat lower than traditional "visually-dedicated" objectives, the Achrovids achieve what is considered to be a more usable and pleasing image without complication or any need to individually monitor each successive image for best results. All Achrovid objectives are mounted via the common "M"-thread (26mm/Whitworth) and are therefore compatible with all "M"-thread instruments. They were specifically designed for all Infinity products that accept external microscope objectives (InfiniTube™, InfiniTube-EX™, Model KC™ and InFocus™) by means of an M26 to M27 Adapter. All have 37mm working distances?except the l0x which has a working distance of 12.5mm. 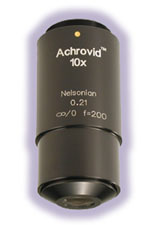 A forthcoming Parfocal Adjuster Tube will allow the l0x Achrovid to equalize itself for parfocality when used with other Achrovids on a revolving turret nosepiece. 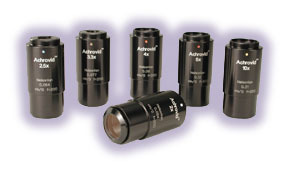 The Achrovid Series represents a breakthrough in consistent, trouble free use coupled with high performance image quality. In addition, they are priced below most?if not all?of their "visual-dedicated" counterparts.